Do you wake up in the morning still exhausted even though you’ve had 8+ hours of sleep? Do you suffer from bloating, gas, or indigestion after most meals? Do you keep gaining weight even though you follow all the healthy eating crazes? Do you struggle with anxiety and constant worrying? Are you sick of sabotaging your efforts to achieve lasting health and happiness? This program, running from May 20th to June 16th, 2019 is specifically designed to help you implement lifestyle habits and dietary practices in your life so that you can start living with boundless energy, glowing skin, & a flat & happy belly! Holistic & Culinary Nutritionist Hi there! My name is Cait and I am a Certified Nutritional Practitioner, Culinary Nutrition Expert, and Yoga Teacher with a keen interest in keeping up to date on the latest and greatest in nutrition and wellness research. I am so passionate about helping my clients feel happier, more energetic, and totally in love with their lives because I’ve been on the other side and knows that there’s more to life than aches, pains, and fatigue. In my practice I focus on healing the body through gentleness, self-compassion, the latest nutrition research, and time-tested, evolution-based dietary concepts. My mission is to help you change your relationship with food so that you can create your healthiest body and your happiest, most fulfilling life. I’ve written for publications such as The Hearty Soul, The Academy of Culinary Nutrition, ALOHA Way Magazine, Mind Body Green, and Herb Affair. Creating space for healing at wellness retreats, cooking classes, and live talks is my passion. Free Yourself From the Tyranny of Weight Loss Gimmicks & Starvation Diets For Good! 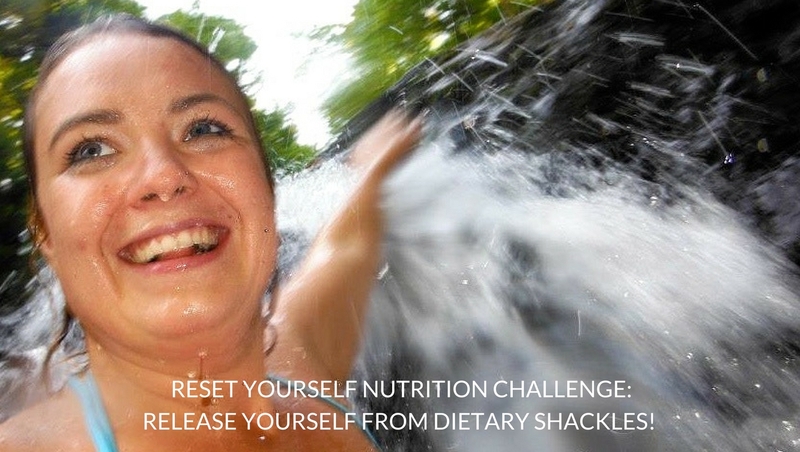 The Reset Yourself Nutrition Challenge contains all the information & support you need to heal your body and start living the life you have always imagined. You’ll be guided through a 4-week elimination style diet designed to remove common inflammatory foods such as gluten, dairy, and refined sugar, while incorporating healing foods and lifestyle practices so that you can reset your waistline, your tastebuds, your digestive system, and your relationship with your body. You will learn exactly which foods support YOUR health so that moving forward you can focus on eating foods that work for your goals, not what someone else says you should be eating. I just wanted to write a huge thank you to Caitlin. You are so knowledgeable, motivational, inspirational, passionate, positive, and the list goes on! I loved working with you throughout this challenge and I’m so excited to continue on with a lot of the healthy habits I have picked up. Thank you so much, you are great!!! Thanks again Cait! Beth M.
Imagine what life would be like if you had knowledge and skills to whip up a healthy meal everyone, even the kids, would love and still meet your weight loss goals. How would you feel if you could reach into the back of the closet, pull out that little black dress, and actually have the confidence to wear it AND feel fabulous? Wouldn’t life be more exciting if you were finally freed from calorie counting and could trust that you were eating the right foods for you body and fitness goals? Imagine the brainspace you would have freed up to create, play, explore, and devote to activities and people you actually enjoy. What if you could finally be free of the brain fog, anxiety, or chronic headaches that control your life so that you can start calling the shots and doing the activities that make your heart sing? Picture a life free from crushing fatigue and afternoon crashes that require constant caffeine and sugar to make it through. What would you do with all that extra time and energy? And finally, imagine that instead of warring with your body and treating her as the enemy, you learned to love and accept her just as she is. Feeding her the foods that keep her healthy and happy, without sacrificing taste! Doing the activities that keep her strong and flexible. Treating her as the cherished friend who supports you so that you can finally live a life of compassion and ease. These are just some of the benefits you will see after completing this program! You’ll be given all the information you need to take your health goals and lifestyle habits to the next level. And the beauty of this program is that you can take the pieces that make sense to you and incorporate them straight away, while giving yourself the chance to continue coming back to this information for education, inspiration, and empowerment because it’s yours FOREVER! Let’s head into the New Year feeling empowered, motivated, nourished, and excited to get outside and explore! Thanks Caitlin. Love your willingness to share of yourself! This Reset has been a wonderful experience. I actually to the time to read and learn and try and am so aware how much better I feel!! Even have hubby converted to no dairy and grains!! Kathie R.
After you learn about the foods that are keeping you fat and sick and the best foods for healing your body, I promise you’ll see amazing results! Things like pounds and inches melting off your body and bloating after meals become a thing of the past. Or your energy levels skyrocket and you’ll suddenly start accomplishing in one day what used take you a week! And perhaps best of all, you’ll stop living inside your head, worrying and stressing out over every little thing, and finally become an active participant in your own life! I’m on a mission to help as many people become as healthy and happy as possible. Luckily after working with so many clients I’ve found several sure-fire ways to improve your health, which includes ditching the so-called “health” foods keeping you bloated, tired, uncomfortable, and sick. I’ve broken it down into a program that outlines the foods and lifestyle habits that are the foundations of either dis-ease or radiant good health. Starting May 20th and running until June 16th, 2019 you’ll be given all the tools, tips, recipes, and support necessary to lay a foundation for lasting change and a mind-body makeover you’ll rave about! I’m not promising you’ll lose 10+lbs over the next 4 weeks, but I can promise that if you follow my guidelines you will be well on your way to a life free from gas, bloating, headaches, anxiety, fatigue, weight gain, and mood swings! You’ll not only be making over what you put into your body, but also how you relate to her, treat her, and think about her. By changing the relationship you have with yourself and the foods that you put into your body you will be setting yourself up for lasting health and happiness by choosing nourishment over poison with every bite. If I hadn’t made these changes I would still be struggling with anxiety, fatigue, and insidious weight gain. But perhaps worst of all I would still be pursuing a career that left me unfulfilled and sick, rather than waking up excited every single day to get to work making the world a little healthier and a little more awesome. There is tons of information to be found on making dietary and lifestyle changes, but trying to put it all together and stay motivated can be tough. That’s why I’ll be with you every step of the way offering up guidance, support, and encouragement as you commit to creating your very best life overflowing with energy, passion, excitement, and a beautiful, healthy, active body ready to take on whatever adventures come your way. This month has been incredible! Heading into the challenge I was ready to accept my body would feel achy and sore forever, my knees and ankles were in pain all the time, and full IBS was on the horizon. I was also accepting my moodiness and cynicism. My body has changed, but more importantly my state of mind has changed dramatically. I feel HAPPY almost all the time and previous to this month was often chasing happiness. I have rebooted my will power. I can’t say enough good stuff about this experience. I am truly so THANKFUL. Caitlin is an amazing facilitator and inspiring person. I knew in my heart how connected mental health was with what we ate, but couldn’t get my head and hands to agree and sign up. I’m a new person. Kristine D.
Thank you so much Cait! This has been great. The biggest thing for me is no more 1:30 slump where I historically could have fallen over. I’ve lost weight, and although that was not the main objective for me, it’s a wicked bonus. Loving the learning! I’ve learned a lot more and look forward to carrying it forward with me. NEW thinking, new tools, new me! I feel fantastic!!! Jenn J.
What’s Included in the Reset Program? that you’ll be experimenting with for the duration of the Reset. Help you discover which specific foods are making you bloated, sick, and unhappy. Get you off the couch to start living again! Push you beyond your comfort zone. This is where the magic of new experience happens and new memories are made! Practice self-love, self-care, and self-compassion. Stop sabotaging your healthy living goals! These guides are packed with delicious recipes you won’t believe are actually healing your body! BONUS: STOP SELF SABOTAGE, SENSATIONAL SMOOTHIES, AND FABULOUS FERMENTATION E-BOOKS! Connect with a new community. Build a community of like-minded friends. Share your experiences, recipes, or struggles. Don’t miss out on the chance to create a relationship with your body, food, and fitness routine that actually stick because you’re given the tools, information, guidance, and support you need to take your goals and turn them into reality. Your body, mind, and soul will thank you! Make Yourself a Priority and Join the Reset Today! “I want to get into my kitchen and cook and I want to eat all the things I’m cooking. No more boredom with food and for me that’s wonderful! I’m still feeling amazing and sleeping like a baby. Best I’ve felt in years!” Jennifer W.
Join the Fun May 20th for Only $98 $75 +Tax! I strive to create educational materials that are of interest. This information should not be taken as medical advice. Always consult with a physician before commencing a new lifestyle or dietary habit. My commitment is to helping individuals interested in and serious about improving their health. There are no refunds offered. Please read program descriptions thoroughly to ensure you are aware of what you’re buying.